How many people does it take to rebuild a beloved Denver landmark and engineering marvel? Along with the three principals mentioned on the project vision page, the construction of the new Electric Fountain required the efforts of many talented people. While not complete, this list of contributors to the effort is meant to be a small thanks to those who made a personal commitment to see this project through to a successful completion. Without their help this project would not have been possible. Entries are listed in the general order they came to work on the project. Plaque donated by Parsons, mounted in the fountain vault. Denver Department of Parks and Recreation: Scott Robson, Doug Woods, Helen Kuykendall, Susan Baird, Juan Marsh, Harry H. Hill, III, Sid Schwarz, Rich Horvat, Teri Henry, JoJo Reynolds, Fred, Bruce, Hidalgo, Ida, Dan and the rest of the City Park team. The support from many employees of the DPR was absolutely essential to the success of the project. Thanks so much to everyone. The unique partnership between the Department of Public Works and the Department of Parks and Recreation was the key ingredient to get the construction project completed with a great team of professionals assembled for the task. The inclusion of the Electric Fountain reconstruction into the Montclair Storm Drainage Project was the boost that the project needed to become a reality. The wealth of amazing photographs at the State Historical Society provided much of the impetus to re-build the Electric Fountain. Without the help of the wonderful staff of the Western History Collection at the Denver Public Library, an accurate reconstruction of the Electric Fountain would not have been possible. In particular, Coi Drummond's discovery of an unpublished photograph by Harry Rhodes helped solve �the mystery of the missing plumbing� for the peacock fan display. The Commission achieved a realistic and sensitive balance in their guidance for the documentation and demolition of the 1908 Electric Fountain and requirements for the construction of the new Electric Fountain. The dedication of Jimmy Blissett (1966-2008) to clean the deck of the 1908 fountain vault and patch the old distribution pipes allowed us to see the fountain plumbing and run the remaining fountain features one last time. This was critical to getting the reconstruction of the fountain right. Thank you so much Jimmy. We miss you, your friendship, enthusiasm and eternal optimism very much. Carl produced a beautiful history of Frederic W. Darlington and his �Electric Fountain No. 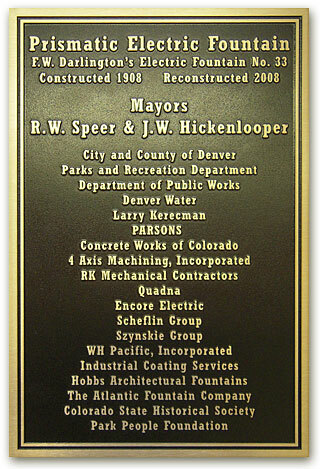 33� - even finding the original contract signed by Darlington and Mayor Robert W. Speer in the Colorado State Archives. Their comprehensive 1999-2000 plans for the restoration of the original Electric Fountain provided the basis for the creation of the 2007 reconstruction documents. Ann's work on the engineering and drawings for the new fountain vault gave us the plans for a structure that will last 75-100 years. Historic accuracy in the reconstruction of the Electric Fountain was critical and Nan provided guidance to meet that goal. While the fountain was not on the initial scope of work for the company charged with the overall design for the Montclair Basin Storm Drainage Project, they quickly integrated it into the overall engineering for the project and provided invaluable help in the design and specification of the new pipelines, infrastructure and equipment for the new fountain. Thanks to William Hobbs and his team of fountain engineers, we re-designed the layout of the distribution plumbing, valves and nozzle manifolds to be more efficient and easier to maintain. Their test tank work with the nozzle angles on the hourglass display was a major help in getting the new hourglass display to look like the original. Charlotte Szynskie provided the leadership necessary for the challenging design/build/document process for the construction of the fountain power and control systems. Assisted by Chris Ivany and Arlen Flax, Charlotte provided great personal and moral and chocolate donut support to Larry Kerecman during the final months of construction of the fountain. The A-Team from Quadna repaired the 2001 strainer system, installed improvements on the new fountain pumps to make them more efficient and installed the sump pumps and submersible ventilation system in the new fountain vault. Through the Integrated Construction contract with the Department of Public Works, members of the Parsons team provided project management, great ideas and personal assistance beyond the call of duty during the entire construction process. The difficult job of building the concrete structure for the new Electric Fountain vault was but one of many challenges met by the incredible team from Concrete Works. The new intake structure, pipelines and main water manifold were all part of the CWC contribution to the project. We were very fortunate to have such an amazing team work on the project, for which they won an award. Under John McGovern's superb leadership, the team from Encore Electric did such a great job on the electrical work for the Electric Fountain that they won two industry awards. John worked closely with the electrical engineer to select the long-lasting and reliable electrical products that will keep the fountain running for decades and was an invaluable partner in the design and fabrication of the electrical controls for the fountain safety interlock and pump drive systems. The incredibly difficult job of creating the manifolds, nozzles and light stands that produce the wonderful displays of the Electric Fountain was put in the capable hands of 4-Axis Machining and their precision work has very visible results. With the help of ace welder Dan Frase from All-Around Fabrication, the metalwork on the fountain deck is a thing of beauty that will last for generations. The amazing installation of the labyrinth of piping, valves and compressed air system inside the fountain vault which supplies water to the fountain features was crafted by the team from RK Mechanical. Atlantic Fountains supplied the Oase Nozzle-Star high power LED fountain lighting and a highly customized version of the ACCESS musical fountain control software which is used to program and schedule the Electric Fountain shows. Thanks to the longest business meeting in history (LOL) the concepts for the new generation of controls for the fountain were codified on a rainy night in Clinton. Erich's years of experience in creating unique and wonderful fountain shows have made the new Electric Fountain truly special. Hydrel: (Chris Berry, The Lighting Agency) manufacturer of the incandescent underwater fixtures and electrical junction boxes. Oase North America: (Aurora Knight) supplier of the Nozzle Star high power LED lighting fixtures. Manufacturer of the fantastic and ever-reliable eDIN DMX-512 signal processing equipment used to run the fountain valves and lights. Colonial Valve: (Dennis DeBlieck, Davis and Davis) supplier of the pneumatically-operated automation valves. Cla-Val: (John Tedder, Rocky Mountain Valve) supplier of the pressure relief valve for the main fountain vault manifold. Easter-Owens: (Janice Miller, Richard Sturtevant) manufacturer of the custom electrical control panels. Current Technology: (Jim Bael, Challenge Technology) Manufacturer of the heavy-duty electrical surge protection equipment in the fountain vault.